My daughter Andrea and I made these adorable, easy chocolate dipped fortune cookies with my grand girls this year. We provide step-by-step instructions over at Two Cuties in the Kitchen! The basic idea: Buy some fortune cookies, melt some dark and white chocolate in separate bowls, dip the fortune cookies in the chocolate and lay them out on waxed paper. 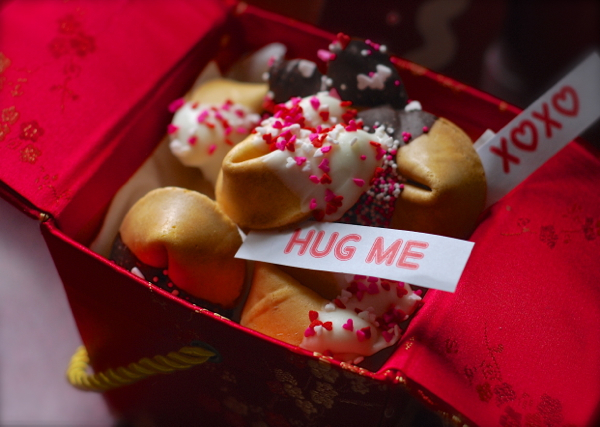 Sprinkle them with cute Valentine sprinkles and allow them to cool completely and harden before transferring to an air tight container until ready to serve. Presenting these in a red satin Chinese “take out” box is a cute way to serve these at the end of a Chinese-themed Valentine’s dinner party! Put a chocolate dipped fortune cookie in a little canning jar with a few little candies. Decorate the lid with a swatch of red and white gingham and tie the top with a piece of red and white baker’s twine.